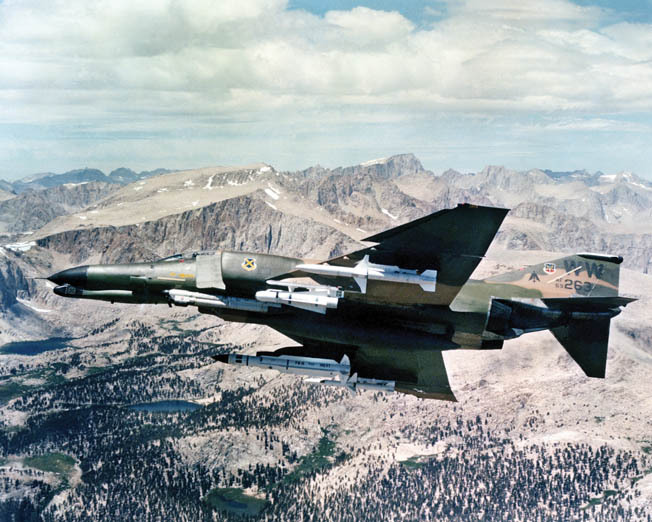 The Wild Weasel concept gave the U.S. Air Force an effective method for destroying North Vietnamese radar and air defense missile systems. Captain John E. Donovan, an electronic warfare officer, monitored the equipment in his F-100F Super Sabre fighter. It was December 22, 1965, and his plane was part of a strike mission searching out enemy antiaircraft sites. Two days earlier, a similar mission had gone badly, resulting in the loss of a plane and its crew. As the F-100F in which he was flying raced through the skies over North Vietnam, Donovan detected a signal from enemy radar known as a Fan Song. He notified the pilot, Captain Allen T. Lamb, who began maneuvering the plane to help locate the radar. Lamb took the plane down until the signal dis- appeared and then ascended until they picked it up again, using the mountains and valleys to help them avoid becoming a target themselves. 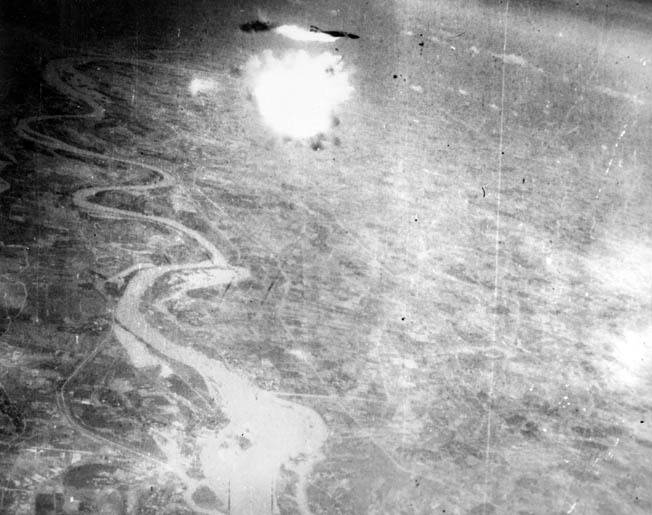 The two men were flying over the southwestern section of the Red River Valley, which was situated northwest of Hanoi. Streaking around a hill, Lamb took the F-100F up to 4,500 feet and began looking for the radar and its attendant SA-2 surface-to-air missiles (SAMs). He saw the SAM deployed in the middle of what looked like a village. He noted the tips of three missiles bristling out from beneath a thatched hut, which afforded the missile battery good camouflage. Wasting no time, Lamb radioed the accompanying F-105D Thunderchief fighter bombers to follow his lead. The F-100 swooped down on the enemy position and fired rockets to mark the target for the bombing runs. The F-105 strike succeeded in knocking out the battery. Debris from the destroyed SAM site flew 400 feet into the air amid a column of smoke. The American aviators had little time to enjoy their triumph. Donovan detected another Fan Song radar. He could tell this one was already well into its attack cycle, detecting what was known as a high-pulse repetition frequency. This meant that the enemy was only about 30 seconds from launching. The operator would double the frequency at this point to provide a sharper radar image. The entire flight turned back toward its base in Thailand, dropping to low altitude to avoid the Fan Song. One victory was enough for the day. The team had successfully proven a new concept of air warfare designed specifically to target the radars that were vital for modern guided missiles to track their targets. The concept, which was code-named Wild Weasel, was coming of age. 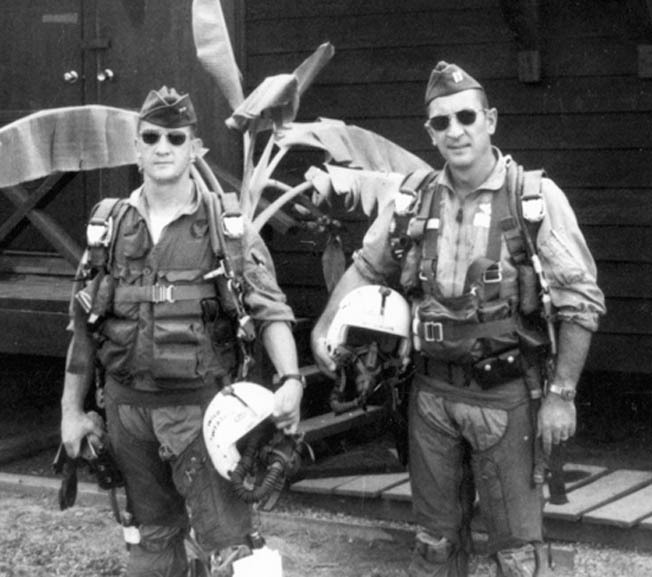 Captains Allen Lamb and Jack Donovan before their historic mission in 1965. As air warfare evolved during the latter half of the 20th century, aircraft had more to worry about than just enemy cannons and machine guns. Advances in rocketry led to powerful new antiaircraft missiles, and developments in electronics greatly increased the capability of radar and guidance systems. The antiaircraft missiles of the World War II-era could barely be counted on to strike a large area target, but by the 1960s much smaller versions could track aircraft in the sky. The pace of progress was accelerating and air forces around the world struggled to counter each new improvement. In the first months of the Second Indochina War, commonly known as the Vietnam War, American aircraft began to suffer losses from North Vietnamese SAMs, which were supplied by the Soviet Union. The SAMs covered medium-to-high altitudes, up to 60,000 feet in the case of the SA-2. When U.S. aircraft came in at low altitude to avoid the missiles, they were vulnerable to traditional antiaircraft fire. To counter this threat, the U.S. Air Force initiated a program called Wild Weasel. The program became so successful that the name has since been applied to every U.S. Air Force aircraft developed for this sort of mission. The mission of a Wild Weasel aircraft is to locate enemy antiaircraft radar and either destroy it or target it for attack by other aircraft, usually accompanying ground attack planes. Radar systems send out waves of energy that reflect off targets, such as aircraft, and return to the radar device, allowing radar operators to track and target the aircraft. But these waves can themselves be detected and tracked back to their source, revealing the position of the radar and allowing the hunted to become the hunters. Accomplishing this task requires specialized equipment and weapons not carried by regular aircraft. The U.S. Air Force began the Wild Weasel program in October 1965, just a few month after the North Vietnamese SAMs, crewed largely by Soviet advisers, began taking their toll of American planes. By early November the basic equipment had been tested and field testing began. Electronic Warfare Officers (EWOs) learned how to operate the electronics and read the displays that would lead them to enemy radar. Those radars not only had to turn on to lock onto a target, but also had to stay on long enough to track it and then home in on it. The test missions were flown against American radar systems that were similar to the Fan Song. EWOs learned that their equipment worked best at medium altitudes flying directly toward the radar beam’s point of origin. Results were poor when flying at low altitude or parallel to the source. The Wild Weasel proved able to detect the Fan Song radar signals beyond the 17-mile range of the SA-2, but it had to get closer to pinpoint the exact location. Once the signal was detected a device called a panoramic scan receiver gave an initial direction the plane could follow to close the range. As the distance grew shorter the signal grew stronger. The shorter range vector homing and ranging set could then start detecting it. The EWO could compare readings to ensure they were on the proper heading and roughly gauge the distance. With that determination made, the crew could search visually for the SAM position. The field testing ended on November 18 and the crews were sent to Southeast Asia for operational testing. There, they would have three months to figure out how to best take the fight to the SAMs. The new Wild Weasel F-100F aircraft arrived at Korat, Thailand, along with their crews, mechanics, and support personnel on November 24. They soon began flying missions over North Vietnam. By late December Donovan and Lamb had knocked out their first SAM site, and the program was on its way to becoming a staple of the U.S. Air Force in Vietnam. The U.S. Air Force dubbed the initial missions Iron Hand. The missions were made up of one F-100F and three or four F-105D Thunderchief fighter bombers, affectionately known as Thuds. The Thuds were faster than the older F-100s and therefore had to fly in a weaving formation to avoid passing the slower lead aircraft. The F-100F flown by Captains Allen Lamb and Jack Donovan on the first successful mission of the Wild Weasel program in North Vietnam on December 22, 1965. The evaluation period ended in January 1966. While the concept was sound, it was rec- ognized that the F-100F was too obsolete to perform effectively. 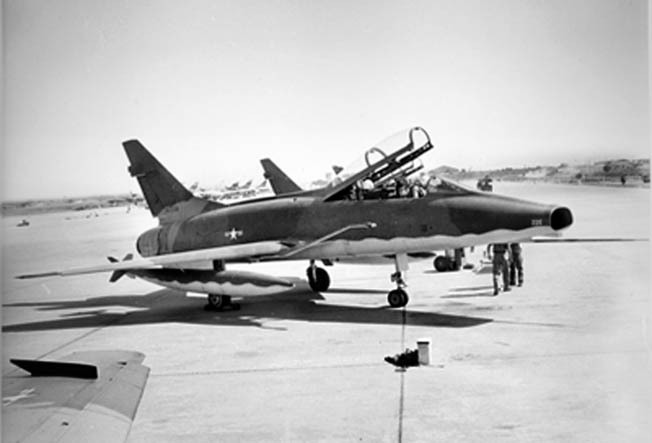 To replace it, the Air Force tested the two-seat F-105F as a Wild Weasel and the first five planes arrived in Korat in May 1966. Another half dozen aircraft arrived a month later. While the Air Force was steadily improving its aircraft, the U.S. Navy designed a new weapon to make the risky job of destroying SAM sites easier. The AGM-45 Shrike was a modification of the Sparrow air-to-air missile designed specifically to home on radar. It was the first of a series of antiradiation missiles that would allow the Wild Weasels to engage the SAMs with more than just unguided rockets. It carried a 149-pound warhead that could easily destroy a radar unit such as the Fan Song. To target a particular radar, the Wild Weasel pilot had to fly directly at it until he was close enough for the homing system to work. The initial versions of the Shrike could not do that until they were within range of the SA-2. Since the Shrike’s rocket motor burned out after 10 seconds, this meant that the missile continued its flight unguided. Still, as long as the missile was aimed accurately it would still detonate within 20 feet of the radar. As a countermeasure, the radar operators would turn their system off, which often threw the missile off track. This was not a complete loss, though, as a switched-off radar was useless for guiding SA-2s. The first U.S. Air Force use of the Shrike missile occurred on April 18, 1966, when a Wild Weasel used one to target a SON-9 radar that was used to direct the fire of 57mm and 100mm antiaircraft guns. The missile disappeared into some haze before striking the target, but the EWO noted the radar stopped functioning, indicating it had been damaged. Nevertheless, Wild Weasels remained vulnerable to gunfire and enemy fighters. By August 1966 only four of the 11 F-105Fs in Thailand were still operable. Other fighter wings operating the F-105Fs had lost five aircraft with two other damaged beyond repair. In October a half dozen replacements arrived and were split between the various units to allow them all to operate. A surface-to-air missile explodes next to an F-4 Phantom. During the final years of the Vietnam War, the North Vietnamese had as many as 200 SA-2 sites in North Vietnam. As missions continued, the limitations of the Shrike were noted by the aircrews. The North Vietnamese radar operators realized the Wild Weasel aircraft had to fly straight at their target so they would turn off their radars whenever they saw a plane coming directly toward them. They also recognized that Wild Weasel hunter-killer teams operated in groups of four or five aircraft. Since this was smaller than the normal strike missions, they would simply shut down while the Americans were nearby. In addition, they started operating their radars for shorter periods. The U.S. Air Force aviators noticed the North Vietnamese counters and developed new tactics of their own. They would fly threateningly toward enemy SAM sites just to get them to shut down. Sometimes they would bomb suspected radar sites just to keep their opponents off balance while strike missions were in the area. If a radar crew was bold enough to start transmitting, the Wild Weasels would quickly and aggressively attack it. They would also fly close to the strike missions to avoid standing out so the enemy would switch on their radars long enough to be targeted. Over time simply suppressing the radars became more of a priority than actually destroying them. One of the most famous Wild Weasel mission of the war took place on March 10, 1967, against the Thai Nguyen Steel Works 40 miles north of Hanoi. This factory complex was protected by an extensive radar-controlled antiaircraft network. F-105 pilot Captain Merlyn Dethlefsen took off carrying a load of bombs in addition to a pair of Shrike missiles. The young pilot wondered how much damage the Shrike could do by itself and hoped that by attacking with heavier weapons he might inflict substantial damage. Dethlefsen was flying with another F-105 Wild Weasel and a pair of F-105D bombers. Together they made up a standard Iron Hand flight. They flew 30 to 45 miles ahead of the main strike force, which equated to about five to seven minutes of flying time. Once over the target, the aircraft would have to stay in the area, otherwise the enemy radar operators would just wait until they were gone and switch their sets back on when the strike force arrived. The factory was defended by both SAMs and traditional antiaircraft guns. As Dethlefsen and the other flyers of the Iron Hand force approached the target they encountered heavy fire from the ground. It was so dense he soon lost sight of the other aircraft in his flight; the smoke from bursting shells was so thick it obscured them. “The sky was just black,” said Dethlefsen. “You know you’re not bulletproof … when explosions are rocking your wings and you can hear metal hitting metal.” Captain Kevin Gilroy, his EWO, soon located a Fan Song radar despite the deluge of steel they were enduring. The pilot quickly launched a Shrike at it, but just as he did so a pair of MiG-21 interceptors attacked them from behind. One MiG-21 launched a heat- seeking missile at the F-105 and Dethlefsen dove to avoid it, flying straight through the layer of flak from the enemy antiaircraft guns. Despite the danger, Dethlefsen stayed over- head until his fuel finally ran low. Gilroy detected another Fan Song and Dethlefsen used his other missile to attack it. Destroyed or not, it went quiet. Minutes later the pilot saw a radar van sitting amid another SA-2 missile site. Diving on it, he strafed the van with his 20mm cannon and blanketed the area with bombs. When they returned to base they expected some recognition for their actions, but some fighter pilots had shot down some MiGs and all the celebration was focused on them. Their skilled flying did not go unremembered, though. In early 1968 Dethlefsen was awarded the Medal of Honor and Gilroy received an Air Force Cross for their accomplishments over Thai Nguyen. Both would complete more than 100 missions over Vietnam. Based on experiences such as those at Thai Nguyen, the U.S. Air Force began changing its tactics. It tightened the flying formations; now the strike force flew one minute behind the leading Iron Hand flight. A second Iron Hand group followed just behind or beside the strike force to deal with other enemy radar-guided weapons. Two flights could cover more area and continue covering the strike force throughout its attack and subsequent withdrawal. One flight could also serve as a decoy, tricking the radar crew into switching on after the first Iron Hand flight passed. In March 1968, the U.S. Air Force also introduced the AGM-78 Standard Anti-Radiation Missile, which boasted a 219-pound warhead. It also had an improved guidance system that would allow the missile to continue tracking even if the radar was switched off after launch. The Standard Anti-Radiation Missile could turn up to 180 degrees after firing, so that the firing aircraft did not have to be flying directly at the radar to target it. The missile had a range of 75 miles, though Wild Weasel aircraft usually flew too low to fire them at that range and acquiring radar at that range was difficult at best. The F-4 Phantom proved capable of destroying SAM sites during the Linebacker operations of 1972 when the North Vietnamese possessed a daunting air-defense network. In August 1967 another Wild Weasel flight covered a hazardous mission against a well- defended target. Lt. Col. James McInerney and his EWO Captain Fred Shannon flew against the defenses of the Paul Doumer Bridge. This mile-long structure was a key piece of infrastructure in the North Vietnamese railroad network. McInerney and Shannon destroyed two missile sites and suppressed four others, allowing the strike force to hit the bridge. During their attacks they dodged three SA-2 missiles and heavy gunfire. The strike force did not suffer a single loss during the mission. Both received the Air Force Cross for their heroism. In the final years of the Vietnam War, American forces began the process of Vietnamization by which U.S. combat forces were withdrawn and the South Vietnamese took on the responsibility for defending their country against North Vietnamese incursions. This applied primarily to U.S. ground forces, although it also included the U.S. Air Force. The North Vietnamese Army’s 1972 Easter Offensive, though, required substantial U.S. Air Force assistance to prevent the collapse of South Vietnam. To assist the South Vietnamese in defeating the offensive, the U.S. Air Force initiated Operation Linebacker. By this point, though, the North Vietnamese had built a large and integrated air defenses system over most of their country, including 200 SA-2 missile sites. Some of the SA-2s could even cover airspace over South Vietnam. In response, the U.S. Air Force deployed a squadron of the improved F-105G Wild Weasel along with the new F-4C. The F-4C had encountered a longer development period but was finally coming into its own. During Operation Linebacker II, the F-4C flew 460 sorties around Hanoi without a single loss. Most of the targets struck were within 25 miles of Hanoi, meaning they were surrounded by what was then the densest air-defense network in the world. During the period of the Linebacker and Linebacker II operations, the North Vietnamese launched more than 4,000 SA-2s at U.S. aircraft, but they downed only 49 planes. This meant it took 81 missile launches to bring down a single aircraft, a ratio partly due to the efforts of the Wild Weasels. After the war the Wild Weasel program was evaluated. Its record with early weapons such as the Shrike was mixed because many of the missile strikes could not be confirmed as having actually destroyed the target. It was recognized that even when they did not destroy a radar site, however, they disrupted its operation sufficiently to dramatically reduce its effectiveness. The Air Force continued the program and it is still in effect. Tags agm-45, allen lamb, American, army, Asia, Camouflage, cannon, China, CIA, cod, EAM, f-100, f-105, F-4 Phantom, fan-song, Flak, Hanoi, Indochina, jack donovan, james, lance, machine gun, medal of honor, missile, Monitor, navy, North Vietnam, north vietnamese, Operation Linebacker, OSS, POW, RADAR, radio, red river valley, river, sa-2, sam, shrike, South Vietnam, South Vietnamese, Soviet Union, Squad, surface to air missile, Tern, thailand, Tory, Troy, Union, Vietnam, Vietnam War, Vietnamization, waves, weapons, wild weasel, WIN, World War I, years of the vietnam war.